the Strait of Dover and into the English Channel to make way for the Atlantic and Boston. clue=Find the places on a map. Start by looking at a good atlas, which shows the Thames estuary. Leitmotiv: King Henry IV, Part I: Act 3 scene 3.
Who would know? who would guess? What a picture to fill your head"
247321 = octal to decimal, thats 85713.
one of many Standard zipcodes for Tucson. I'll have to figure out the specific area. the 15 balls in the triangle. Basically, there's a short paragraph about the probability of Adenine forming on it's own. The probability problem seems to be set forth by Creationists. Maybe 15! is related to creationism in the announcements . as long as the meeting did its business and everybody slipped quietly away. triangle. While suggestive of an eight-ball racking, the racking is very un-orthodox. it. However, S14, referenced in the quote, appears  in the diagram. but I only see a five in it. Why isn't there a general discussion area here? The latin at the bottom, "Ora pro nobis, ora pro me", of course is "pray for us, pray for me". Banish not him thy Harry's company. Banish plump Jack, and banish all the world. Prince: I do; I will." Re. "What a night for the dancing dead.."
notes, there was a change in notions of death that came with the Reformation despite which, the imagery persisted. Hebrew letter Nun by western occultists. 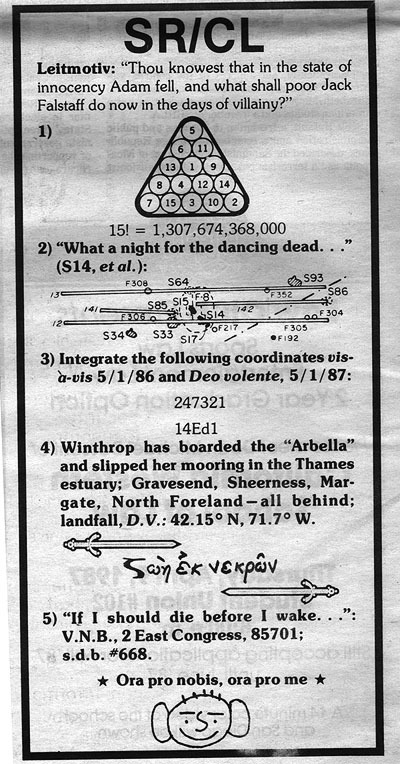 following announcement for Sept. 14, '87 some five months following the above. There are 1,307,674,368,000 possible ways of arranging the 15 balls in order. is still VNB, I do not know). Following this, s.d.b. is probably 'safety deposit box'. something should fail, retrieve the contents of the safety deposit box. hance - it is there, and it is a Bank One now. There are pictures of said SD box on a few other MM pages. #3: Is this the only time that there's a referral to a future ad? I'm a first time poster, long time lurker, etc., etc. possible to find the archaeological survey maps of the Presidio site, etc. and apply the above to it? select "Get Map" or revise your search. likely that the key that was sent to Bryan is the key to said box? Did you ever find out WHICH box they keep referring to? hance - I haven't seen a safety deposit key before, so I can't tell. And I always assumed box # was 668 (see other ads). Faith" which seems to have been the work of the Scottish Covenanters. As mentioned in an earlier post, both 247321 octal and 14Ed1 hexadecimal equal 85713 decimal. 8+5+7+1+3 = 24 (12+12) also (8+8+8). The gematria number value of the Greek word for Jesus (IHSOUS) is 888.
alphabet. Also, numbers have multiple levels of meaning, especially when converted from one base number system to the next. Convert or switch numbers among binary, decimal, pental, octal, or hexadecimal. In the 04.04.2005 posting by Juls, he makes mention of the two swords. A Lutheran reference to the two swords can be found in the Triglot Concordia (The Symbolical Books of the Evangelical Lutheran Church) at: http://www.borderschess.org/TrigBOC.pdf in the first paragraph of page 113 within the Apology of the Augsburg Confession. "..., therefore the Pope must necessarily be [a God on earth, the supreme Majesty,] lord of the whole world, of all the kingdoms of the world, of all things private and public, and must have absolute power in temporal and spiritual things, and both swords, the spiritual and temporal." Also, see the first sermon preached (by Hugh Latimer) before King Edward the Sixth, March 8, 1549. "For in this world God hath two swords, the one is a temporal sword, the other a spiritual. The temporal sword resteth in the hands of kings, magistrates, and rulers, under him; whereunto all subjects, as well the clergy as the laity, be subject, and punishable for any offence contrary to the same book. The spiritual sword is in the hands of the ministers and preachers; whereunto all kings, magistrates, and rulers, ought to be obedient; that is, to hear and follow, so long as the ministers sit in Christ's chair; that is, speaking out of Christ's book. The king correcteth transgressors with the temporal sword; yea, and the preacher also, if he be an offender. But the preacher cannot correct the king, if he be a transgressor of God's word, with the temporal sword; but he must correct and reprove him with the spiritual sword; fearing no man; setting God only before his eyes, under whom he is a minister, to supplant and root up all vice and mischief by God's word: whereunto all men ought to be obedient; as is mentioned in many places of scripture, and amongst many this is one, Quaecunque jusserint vos servare, servate et facite. "Whatsoever they bid you observe, that observe and do." Therefore let the preacher teach, improve, amend, and instruct in righteousness, with the spiritual sword; fearing no man, though death should ensue. Thus Moses, fearing no man, with this sword did reprove king Pharao at God's commandment." in "the billiard room". If this is a group of graduates keeping in touch, perhaps some of them play pool? Complete newbie ... already addicted. this ad, 'smiley face' has five hairs and the ball at the top of the triangular array is number five? Or are the hairs a method for communicating which codex to use for translation? 4) John Winthrop was the first governor of the colony of Massachusetts, and did arrive in the New World aboard the ship "Arbella." The coordinates given are for south/central Massachusetts. I'm pretty sure the greek by those two swords says "Saved from death." Though you guys may already know that. reds on a snooker table. leading to the phrase 'snookered' as in stuck. be translated as something along the lines of "life out of death". New, greek, found this whole thing rather curious and interesting and thought I could offer some help. but maybe someone who has a clue could find a translation and check if there is more to be found there.